A four hour circular walk towards Southam today. 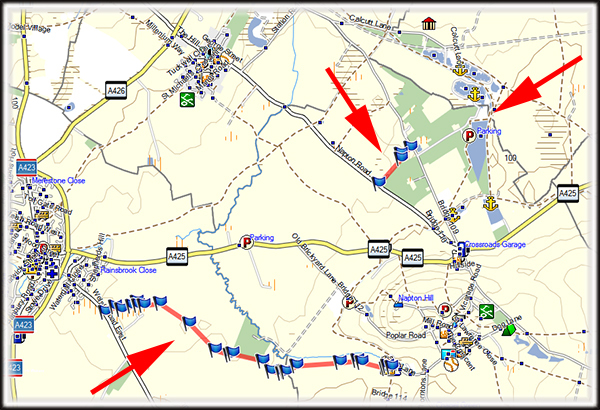 There were two pieces of public footpath to be recorded and added to the Open Street Map. It was a strange day, with the weather on one side of the boat almost fine whereas the other side looked grey and grim. 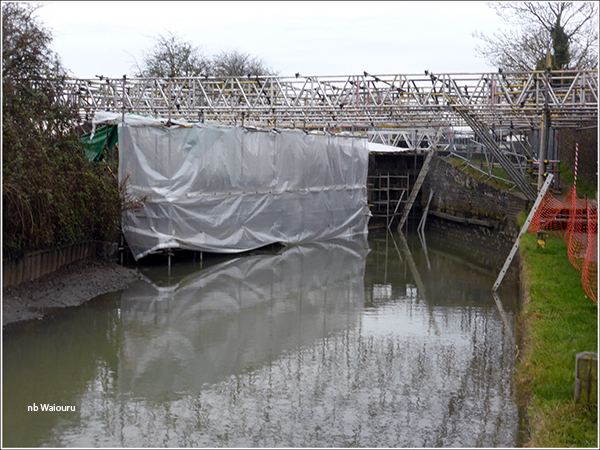 Our mooring above Calcutt Top Lock is rather exposed and Waiouru has been rocking and rolling in the wind. At one point we thought she might be adrift. I thought I might have made a mistake with my clothing. The bottom half consisted of lightweight long trousers and budgie smugglers. On top I had a thermal vest, light Tshirt and summer raincoat. The wind went right through the clothing in exposed locations which meant it was a brisk walk in order to keep warm. You might think there’s foam on the water in the following photo but it Is actually ice which has built up at the approach to the lock. 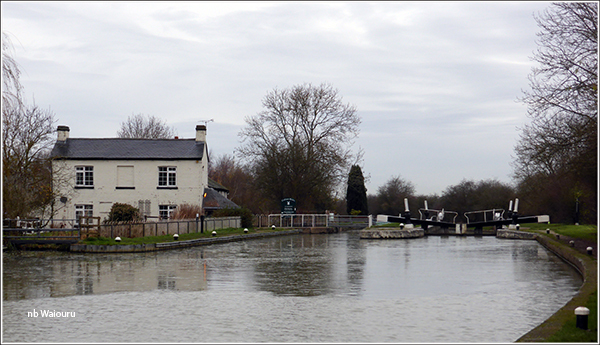 The planned route took me west across the fields to Southam and then south to the Napton Flight of locks, before returning to Waiouru via the towpath. The right arrow is our mooring whilst the other two arrows point to the footpaths I wanted to walk and record. I have previous walked in this general area and last time I struggled at times to find the marked paths. Some of them were rather overgrown. A similar situation existed today. 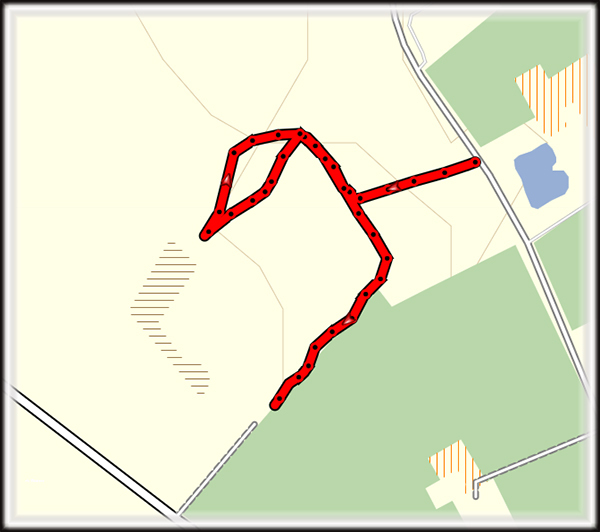 The following gps traces shows how I had to wander around to find the path. 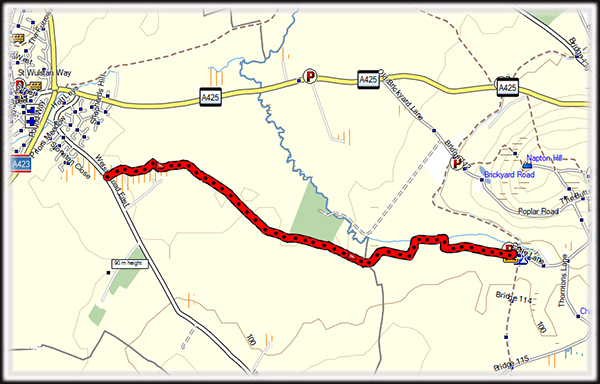 The route from the end of this path took me to a bridal path which had a farm gate across it. 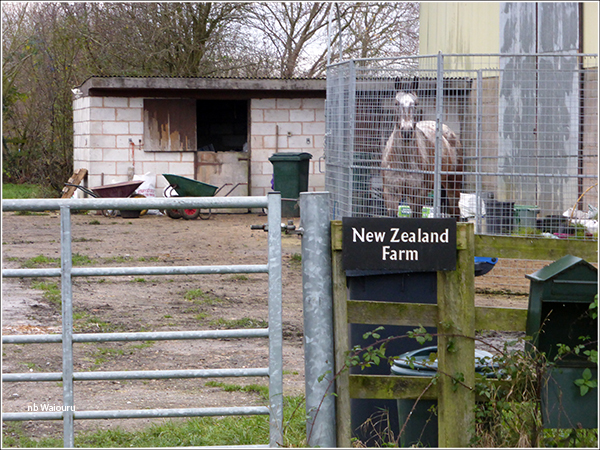 OK… why take a photo of a gate post and horse? No, it’s the name of the farm that caught my eye! How unusual. The first part of the bridal path was quite firm, however it then degenerated into a narrow muddy track that had been cut up by the passage of numerous horses. Eventually I reached Southam discovering it’s quite a large village. The area I walked through consisted of reasonably new housing estates. I assume it’s a satellite residential centre for Rugby. The second footpath had also been used by horses in places. This time the ground was partially frozen meaning I wasn’t paddling through mud. Instead I was endeavouring not to turn an ankle. I came upon a container which appeared to have been converted into a dwelling located in the middle of a large field. There were four cars parked in front of it along with a wind sock. Out in front was a square of well mown lush green grass. 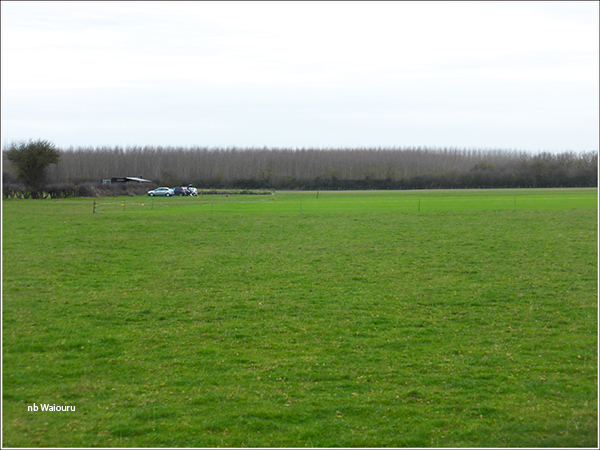 The marked area was too short for a grass landing strip and I wondered what its purpose was. Then I noticed a model aeroplane in the back of one of the vehicles. It’s a club house and landing strip for model aeroplanes! The farmers have been out ploughing the fields and if you look closely at the above gps trace you can see where I had to walk around one large field. 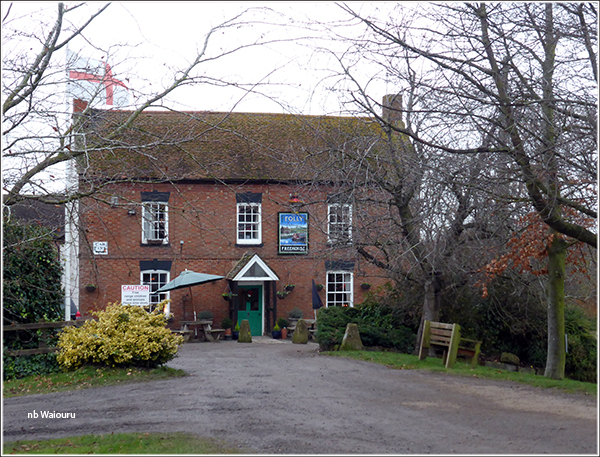 The footpath ended at The Folly Pub beside the canal. The Napton Flight is currently closed for maintenance and as I was there I decided on a short detour to see what work was being undertaken. 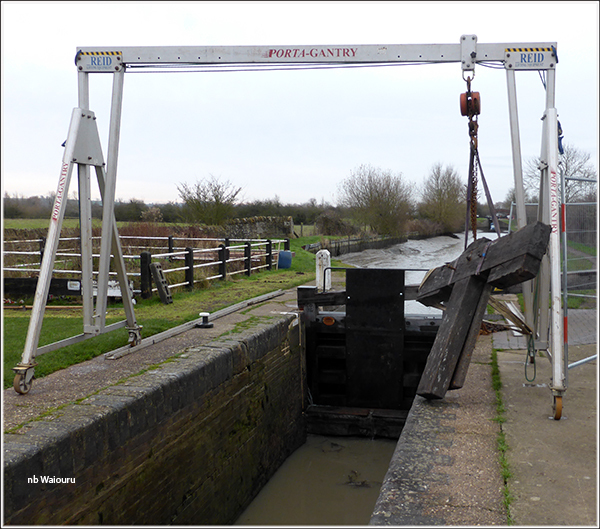 The top gate on the bottom lock has been replaced. A large tree beside lock 9 has been very severely pruned. Actually, I think it’s going to be removed! 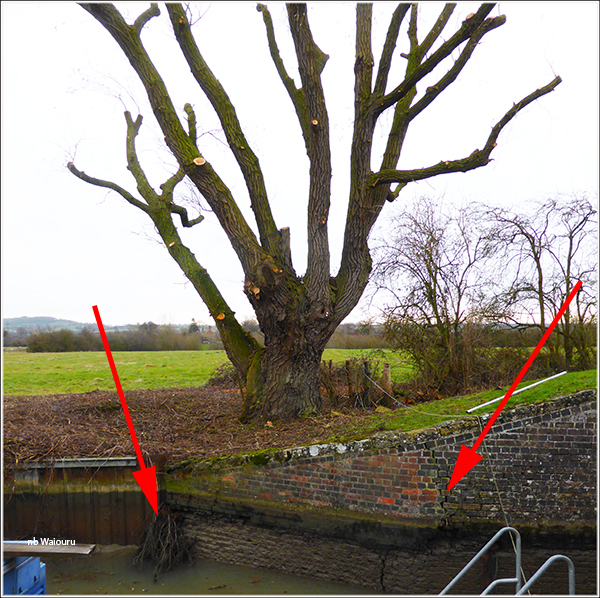 If you look closely at the following photo the lock approach wall has a large crack running down it and two the left a large clump of roots from the tree have forced themselves around the end of the wall. It appears to me that the tree has been forcing the wall out of place. The next lock is the one with the collapsed approach wall. The entire area is covered in scaffolding and tarpaulins. My assumption is this has been done to protect the new approach wall whilst the mortar sets. It is very difficult to see what’s happening but I did manage to poke the camera through the fencing and take a partial photo of the new brickwork. 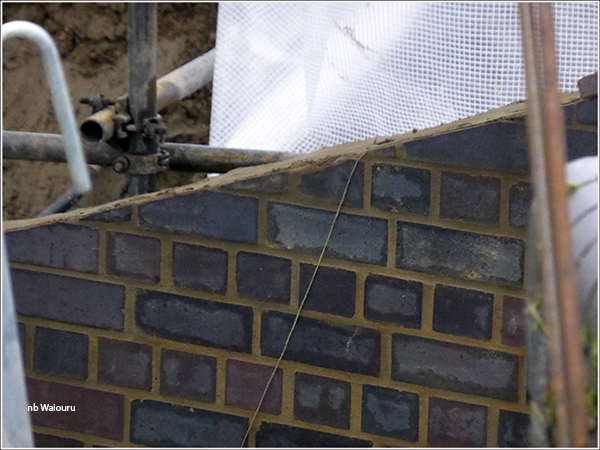 Once the brickwork has set they will be able to backfill the cavity behind. The area below the locks was rather quiet. One boater has scored the best mooring in the area (the water point). There was one boat on the 48 hour moorings and three around the corner on the 14 day moorings. 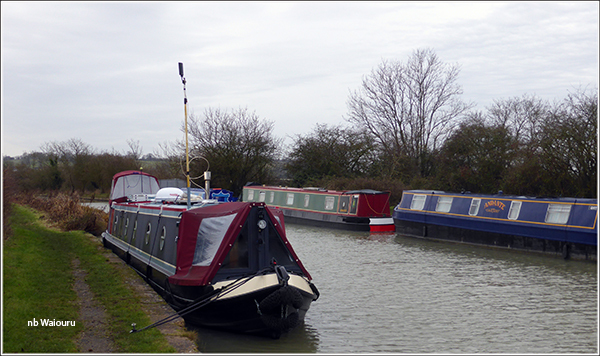 Plenty of vacant moorings. I noticed an almost new inflatable fender in the canal on my way back to Napton Junction. An interesting challenge working out how to recover it without going for a swim. Success in the end. I notice it has an almost new Midland Chandler label. Should I ask Midland Chandlers if they can remember the purchaser? After losing a few myself I probably wont! Nice post Tom especially about what's happening at Napton. Thank you. Boring blog posts will resume shortly.